Once a prospect is on the call, send the meeting invite in two clicks and have them accept the meeting. Studies show that once a prospect took some action in your favor (as small as confirming the invite) – the likelihood of them taking more steps in the same direction is higher. Chili Piper inserts a button in FrontSpin linking to the right calendar (the SDR for their own meetings, or the Account Executive for handoff meetings). 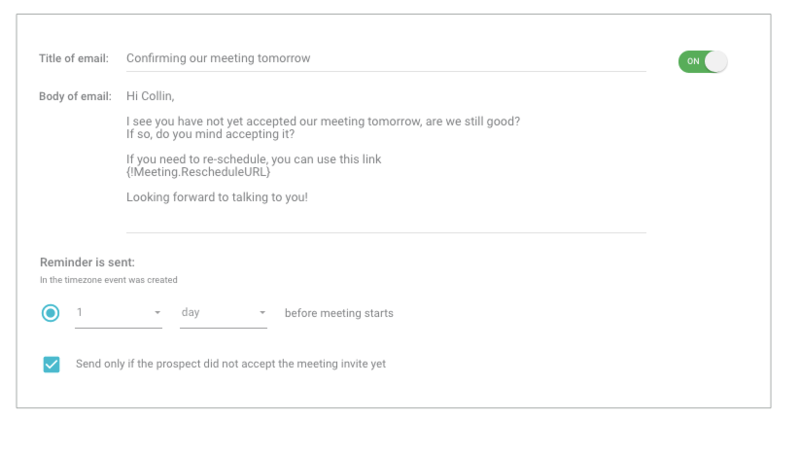 A meeting template pre-fills all the details, including the corresponding video conference info. The meeting invite is sent natively from Google Calendar. Once you experience this power you won’t want to book meetings in any other way. Not to mention, the meeting is recorded in Salesforce as well. For most of us, the most important things that need attention are happening within a one week span. The next quarter feels distant in our minds. The best salespeople already know this and take advantage by creating deal momentum. They make sure the time slots they propose are within reach. Some Chili Piper customers go as far as limiting the booking window to the next 48 hours to move deals faster. You can make it easier for your customers to reach you and add a calendar to your signature. You can add your own URL (visible under the “My Meetings” settings) or a team URL (visible under the “Online Booking” tab). The same structure can be used in the body of the email. When the prospect books a meeting in one click because they are automatically recognized – the conversion rate dramatically improves. You’ll reduce your no shows like never before.